In 1990 I got a postcard from my aunt who was vacationing in Hawaii with some friends. It was pretty standard other than the very last line; I bought you a real Hawaiian license plate. As a 9 year old I was interested in transportation and cars but this was something completely different. It almost seemed random at the time as I had never heard of anyone collecting them, let along paying for one. Over the next few years I came across a few BC plates; one from a neighbour, one from a friend’s dad and one I found in some bushes near our house. 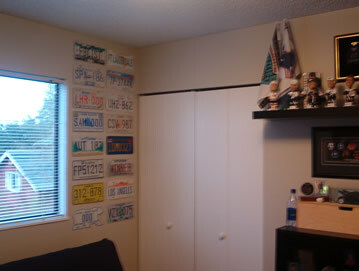 After assembling a modest number of plates I decided to put them up in my bedroom. Not long after that they were taken down and put away by my mom who was not a fan! When I moved out on my own I decided to put the plates back up and maybe even collect a plate from each US state and Canadian province. 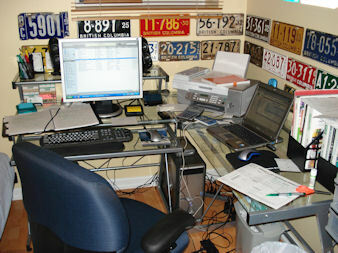 After completing that goal I began my run of BC passenger plates, not an easy or cheap feat to accomplish. I’m still working on completing my BC passenger run but have also begun birth year runs for myself and my two daughters. Number of plates in my collection: Currently over 500 including booster plates. Approximately 37% of my collection consists of plates from British Columbia (no surprise there!). Favorite plate given to me: Australia ‘Victorian Olympians on the Move’ plate. The plate belonged to Sean Quilty, an Australian long-distance runner who competed in several marathons including the 1994 Commonwealth Games in Victoria, BC and the 1996 Summer Olympics in Atlanta. Are any of the plates on this site available for sale or trade? Nope, these are all part of my collection and not for sale or trade. I don’t normally keep a large inventory of extra plates but the ones I do will be posted on my Facebook page. Where do you get your plates from? 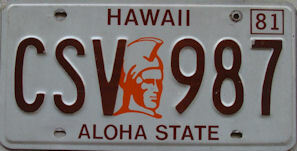 I purchase the large majority of my plates online through other license plate sites, Facebook and eBay (click here for a list of recommended sellers). Classifieds sites like craigslist can also be helpful. Word of mouth also works well. You’d be surprised how often plates turn up from friends and family who know you collect! I’m looking for a specific plate. Do you have one for sale? As mentioned above I don’t keep a large number of extra plates but I will try my best to help you out. I do this as a hobby so it’s always nice to help out a fellow collector. I have a plate I would like to sell. Are you interested? Possibly, if you contact me by email or through my Facebook page I can take a look. If it’s not something I need I can help you connect with other collectors that may be interested. Can you give me more information on a plate I have? I’m definitely no expert on everything plate related but I’ll do my best to help you out or connect you with someone who can. What does your wife think of your collection? I think the word ‘indifferent’ would sum it up. As long as the plates stay in the garage she’s happy. And as the saying goes ‘happy wife, happy life’.